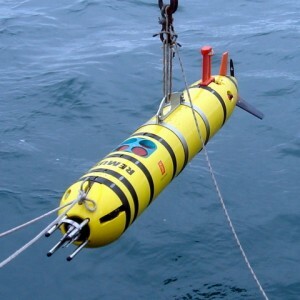 Rockland and Hydroid Inc. collaborated in the integration of turbulence sensors into the Remus 600 AUV. The turbulence sensors (shear probes and thermistors) are fully integrated in the nose cone of the AUV. 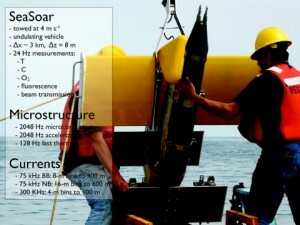 Data from the sensors are sampled by a dedicated PC104 computer system, that is situated in the main pressure case (science bay) of the AUV. 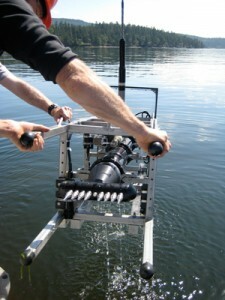 The “Hammerhead” is a customized towed instrument developed for Prof. Eric Kunze at the University of Victoria. The instrument has modified nose cone that holds an array of microstructure sensors. Data are recorded internally and uploaded to a PC after recovery of the instrument. Only scalar micro-structure is measured with this system owing to the high level of vibration on the towed vehicle that houses the Hammerhead. The tow frame is a stainless steel construction with heavy lead weights. This design gives the vehicle a lot of mass, resulting in a steep tow angle and a precise location of the vehicle below the ship. TOMASI is a SeaSoar towed vehicle outfitted with a real-time telemetering microstructure package. This system provided several challenges that the scientists and engineers at Rockland were able to meet satisfactorily. The original SeaSoar vehicle was equipped with a 3-conductor steel cable. One conductor was used to energize the Seabird SBE9 CTD package with 250 VDC. The armor was used for the return. The remaining 2 conductors were used to control the flaps on the Seasoar with a low-frequency current loop. There were no remaining conductors for the real-time telemetry of data. However, microstructure measurements was the main object of this client and real-time monitoring of the signals is crucial. With an internally recording system, the user would be “flying blind” and unaware of sensor or other problems. To provide real-time measurements, Rockland modified its normal telemetering system of SeaSoar to use the 14VDC auxiliary power output from the SBE9 to energize the microstructure instrumentation. A special coupler was developed to combine the low-frequency control current and the high-frequency digital microstructure data stream on to the same pair of conductors, without any mutual interference. In addition, because RSI instruments use differential Manchester II communication, there was no mutual interference with the non-differential Sea-Bird communication (on its 250 VDC power line) and the microstructure data stream. Finally, a pair of custom cables were installed so that the microstructure instrumentation could “borrow” the frequency outputs from both pairs of SBE3/4 sensors and add them to the microstructure data stream. This added a redundant copy of the SBE3/4 signals into the data files of the microstructure signals which makes it easy for the user to co-examine the high accuracy temperature and salinity measurements of the Seabird sensors with the microstructure signals. Only scalar micro-structure is measured with this system owing to the high level of vibration on a Seasoar towed vehicle. The scalar microstructure sensors were 2 dual needle conductivity sensors and a pair of FP07 thermistors. Other sensors are a pressure transducer and a 3-axis accelerometer. The tow cable was 1000 m long and data were transmitted at 500 kilo-bits per second. Image curtsey of Shaun Johnston and Dan Rudnick of Scripps, UCSD. 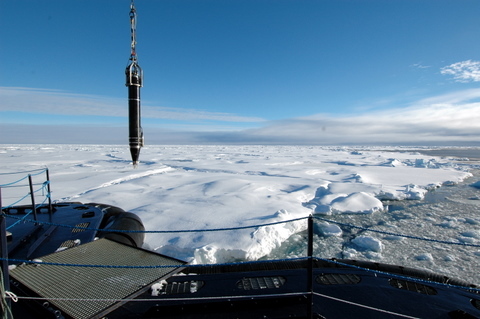 A normal tethered and telemetering VMP-2000 modified with (a) a thick-wall pressure case to withstand depths of 5500 m, (b) an internal data recording system, and (c) its buoyancy and tail section removed, being deployed at the North Pole. 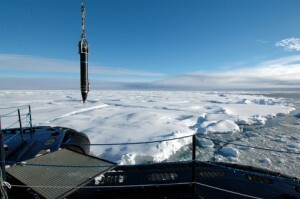 The only available cable on this ice breaker was a single conductor steel armored “CTD” cable. The cable is used to supply 220 VAC, 50 Hz to energize the electronics. No conductors were available for telemetry of data. A special harness and bungee coupling was produced at WHOI to suspend the instrument from the tether. Instrumentation include; 2 shear probes, 2 FP07 thermistors, three-axis accelerometers, pressure transducer, and SBE3/4/5 thermometer, conductivity sensor and pump. RSI will work closely with its clients to produce micro-structure instruments for all unusual applications.